I was going to make stewed rabbit tonight in a clever rebuke to all things football. However, being short on time and needing to use up many leftovers in the fridge, I found that chips and pizza were actually going to be the best choice for a quick dinner. My dreams for a rabbit-themed Super Bowl have been dashed yet again! 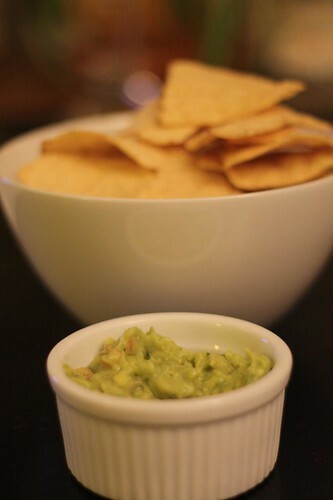 I started off by simply serving chips and guacamole. I figured why fuss with all that salsa and sour cream this year? Why not just keep it simple? Also, I foolishly forgot to purchase salsa. Next I made this pizza. I wanted this to be an amalgamation of all of my favorite barbecue chicken pizzas at restaurants of yesteryear. So it was that I used the rest of my Cue Culture pomegranate jalapeño barbecue sauce by tossing it with the leftover pulled chicken from the chicken I roasted earlier in the week. I put this on some pizza dough, topped it with fresh mozzarella, sliced red onion, sliced pimiento stuffed green olives, and topped it all with some robusto gouda cheese and sliced green onion. 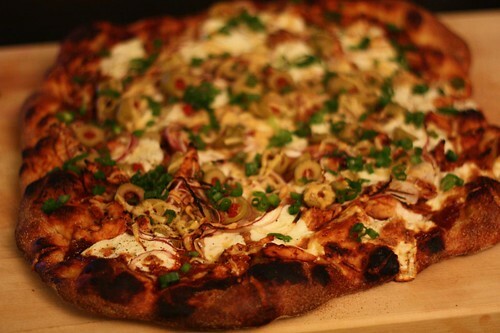 This is taken from some of my favorite barbecue chicken pizzas of the past. The only one I can remember for certain was the green olive element I stole from Pizza Pie-er, a restaurant I used to go to frequently when I lived in Rhode Island. I'm not sure where the other elements come from. High, white, fluffy summer clouds. A soft breeze through a citrus grove. A heavenly bite of orange chiffon cake. All of these come to your mind as you lift our pale golden wheat ale to your lips. 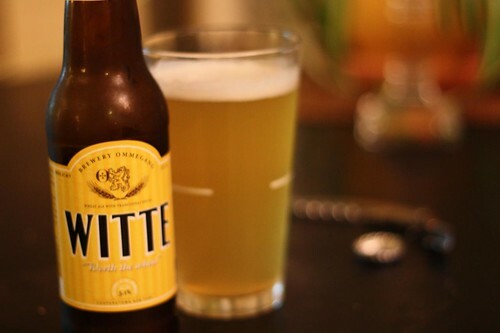 It's so soft, so light on your tongue, you think, as the tart lemon, bitter orange, and subtle spiciness of coriander arrive to round out the intriguing delicacy of this delicious ale. You smile, knowing you have more in the fridge. You know what? I think I enjoyed this beer a lot more before I read that. Particularly the part about the fluffy clouds. I think we all could have done without that part. What do you think is the best element to make sure your dessert contains? Sweetness? Chocolate? I believe it is something different: overcoming your fears. For dessert Jen asked me to pick up some ingredients. When I got home I was horrified to learn that she intended to make root beer floats. You see, I haven't had a root bear float for about twenty-five years. The reason is quite simple: I got incredibly sick off of a root beer float about twenty-five years ago and I've never had one since. That night it was exceptionally hot and humid and my father took me out for ice cream. I decided to have a root beer float, something I don't think I'd ever had before. Ever since I haven't trusted them because the night ended with me throwing up multiple times in the backseat of my father's Volkswagen Beetle while turning right onto the Hamlet Avenue Bridge. Perhaps it was the temperature in the high 90's. Maybe it was the fact that I'd downed the root beer float in less than a minute. Or it could have been the ride in the backseat of a Volkswagen Beetle with questionable rear shocks. At any rate I threw up a lot and it scarred me for life. 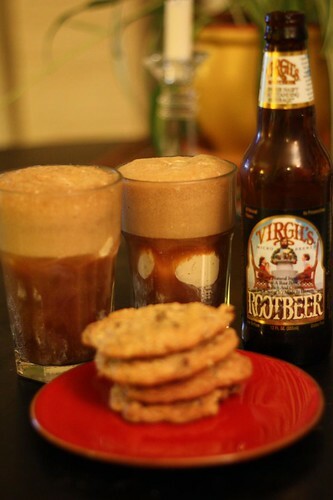 After all was said and done I found that this root beer float with fresh-baked chocolate chip cookies was quite tasty. The temperature of 26°F made this all much more palatable. This time if I throw up it probably has way more to do with the Black Eyed Peas than the root beer float.